In Rotterdam, there’s something unusual to look at almost everywhere you turn. 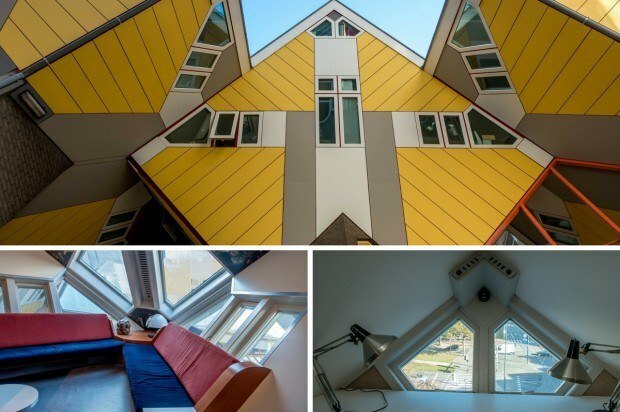 From soaring skyscrapers and artistic bridges to homes that seem almost impossible to live in thanks to their unique construction, so much in the Netherlands’ second-largest city is done with a flourish. Much of the beauty now present in Rotterdam architecture arose from dark times. During World War II, the city was all but destroyed after heavy German bombing. 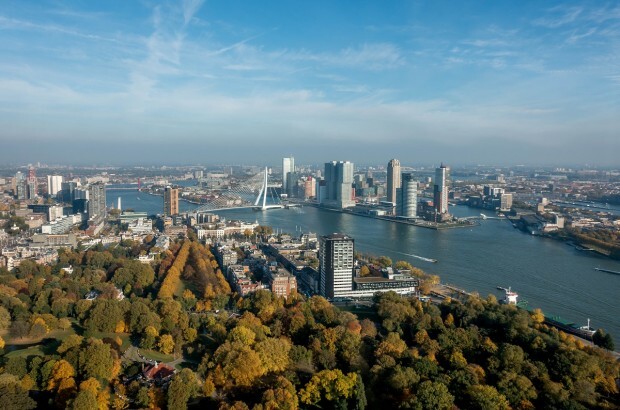 Rather than restoring the Old Town to its pre-war appearance (as cities like Riga and Warsaw did), Rotterdam decided to run toward the future. Beginning in the 1950s, the city streets and skyline began to include more experimental elements with a clearly modern flare. And that shows no sign of slowing, even today. Modern-day Rotterdam is a mixture of aesthetics. Design lovers from around the world come here to admire the city – its art, its architecture, and its courage to move forward in such a bold way. 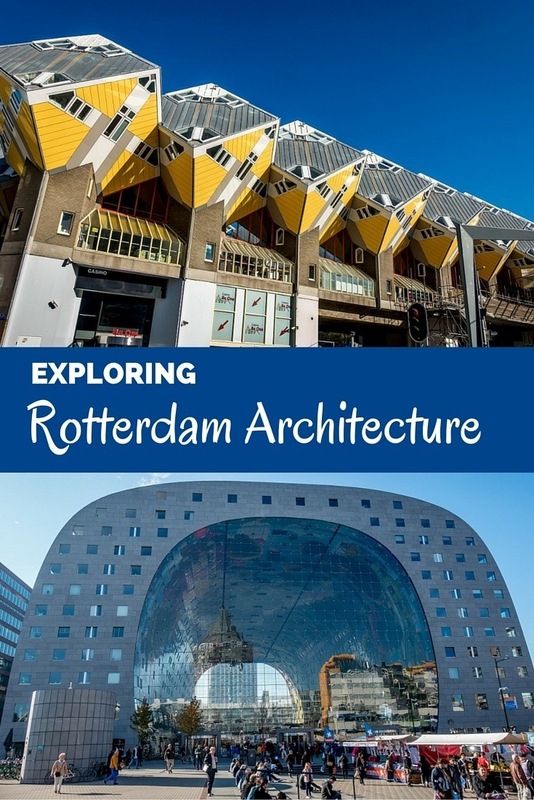 While I don’t claim to be an architecture aficionado, I was impressed by the variety and uniqueness of Rotterdam’s buildings. Here’s a look at some of Rotterdam’s newer additions as well as a handful of important ones that survived the war. 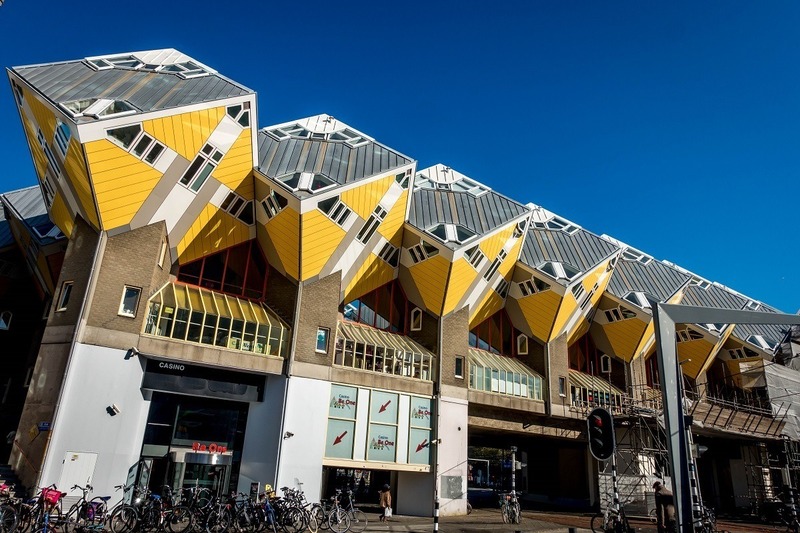 One of the most recognizable examples of Rotterdam architecture, the Cube Houses were designed by Dutch architect Piet Blom in the early 1980s. Each cube sits on a hexagonally-shaped base, taking the form of an abstract tree. From the outside, they look like something out of a Picasso painting rather than a place people could actually live. The Show-Cube is a fully-furnished cube house that serves a museum. It shows that it is indeed possible for people to live in these unique structures. Each house has three floors with all the basic amenities you would expect. Furnishing the properties can be a challenge, though, as most of the furniture has to be custom-made to accommodate the 55-degree angle of the building. 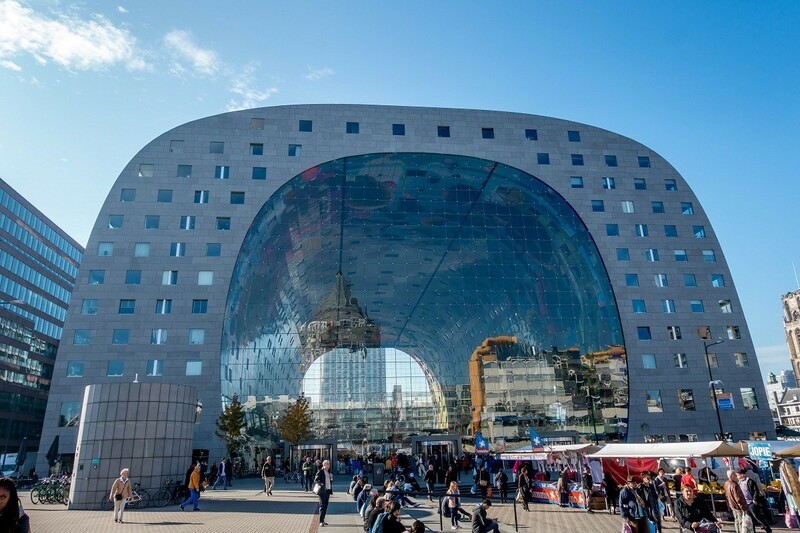 Everything about Rotterdam’s Market Hall (Markthal) is impressive. The horseshoe-shaped building itself is enormous, rising out of a plaza near the city center. 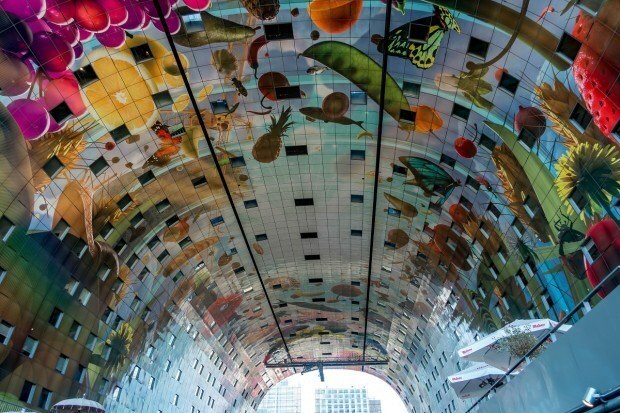 Inside, the ceiling is covered with bright fruits, vegetables, and other images from nature in an 11,000-square-meter artwork by Arno Coenen. As you wander through the aisles of food stalls and restaurants, it’s hard not to lose yourself in the colors and scents of the foods from around the world. Unusual spices, fresh fruits, delectable pastries, tapas, hamburgers, and more are all available here. It’s a great place to have a meal and people watch for a while. There’s so much to look at, you may not even notice that the market is literally surrounded by over 200 apartments built into the ceiling and walls of this distinctive building. Since it opened in 1996, the Erasmus Bridge has become an icon in Rotterdam. It’s named for one of the city’s most famous sons, Desiderius Erasmus, a renowned Christian Renaissance humanist and scholar. 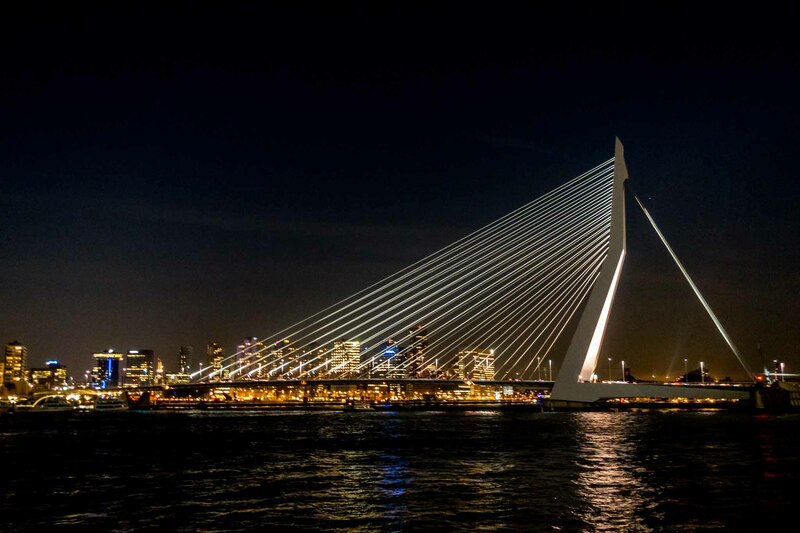 The 800-meter-long bridge connects the north and south parts of Rotterdam and is nicknamed The Swan thanks to its gleaming white, graceful shape. Close to the southern end of the Erasmus Bridge, the three stacked and interconnecting towers of the De Rotterdam building rise high into the city skyline. 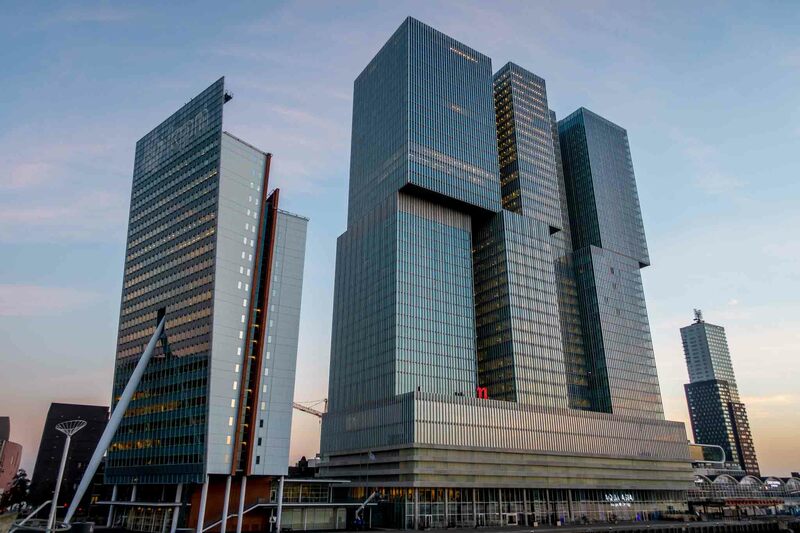 Designed by the Netherlands’ most celebrated architect, Rem Koolhaas, this 150-meter-tall building is home to offices, apartments, hotel and conference facilities, and restaurants. De Rotterdam is one of the biggest buildings in Europe and is used by about 5000 people a day. In 2013, The New Institute (Het Nieuwe Instituut) was formed when three separate architecture and design organizations merged. The resulting Institute has one of the largest architecture collections in the world, including sketches, journals, photographs, and over 35,000 architecture books. Rotating exhibitions focus on landscape architecture and urban, interior, industrial, and graphic design. The buildings that comprise the Institute are also a work of art themselves. Designed by Dutch architect Jo Coenen, the buildings include a concrete and brick exhibition and a high glass section, which sits under a steel pergola. The archive stands on concrete discs, creating an arcade that is lit at night by a sculpture by Peter Struycken. 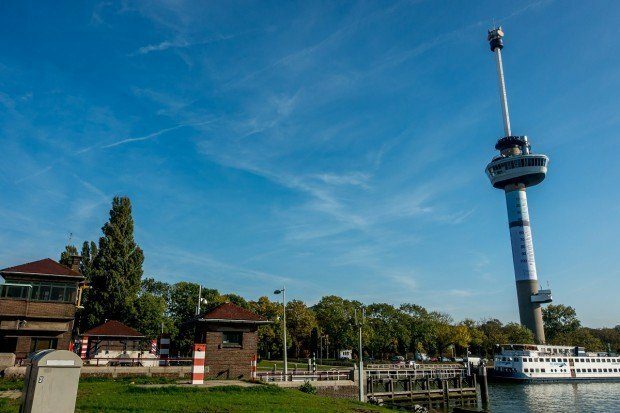 The Euromast is hard to miss in Rotterdam. The 185-meter-tall tower sticks up out of the landscape like…well, a massive tower. It features an observation platform 96 meters up as well as a restaurant that serves brunch, lunch, and dinner, depending on the day of the week. The Euromast’s most remarkable feature is a rotating elevator that takes you 185 meters in the air, providing 360-degree views of Rotterdam. For more adventurous types, it’s possible to abseil or zipline your way down from the tower during the warmer months. Designed by Dutch architect Hugh Maaskant, the Euromast was unveiled for an international garden festival in 1960. 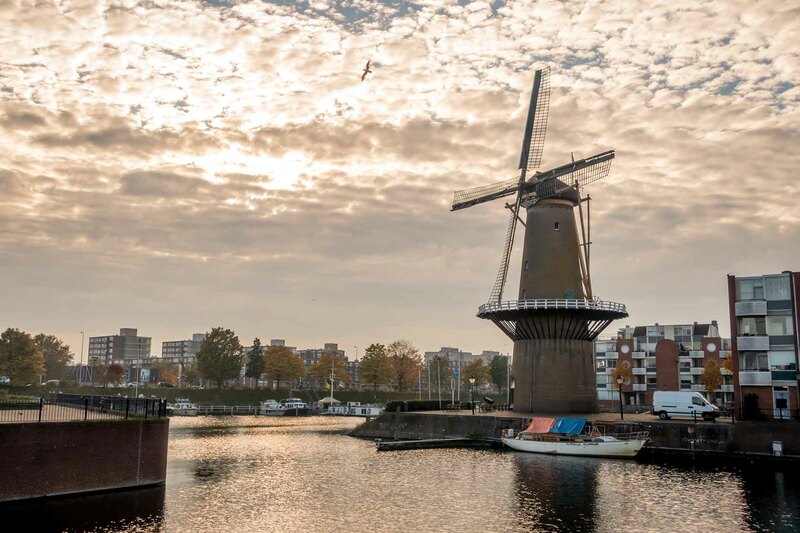 It’s been listed as a Dutch national monument since 2010. 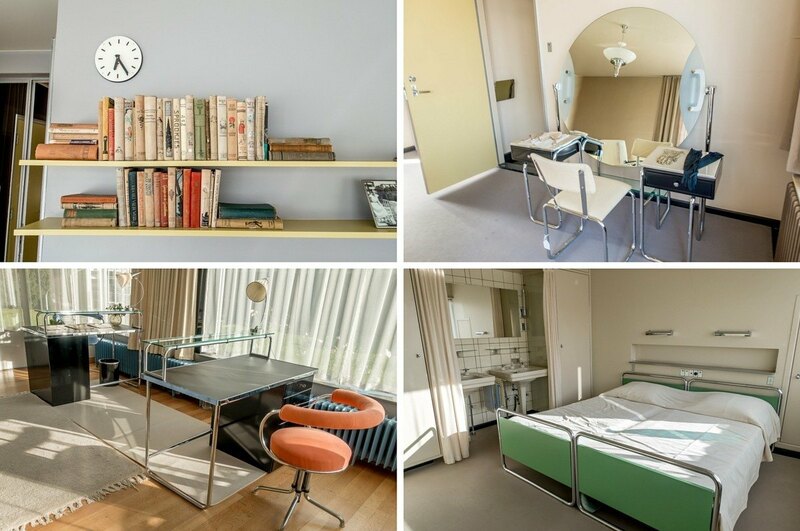 The Sonneveld House (Huis Sonneveld) is one of the best-preserved houses in the Nieuwe Bouwen style, the Dutch branch of the International School of Modernism. Designed by the architecture firm Brinkman & Van der Vlugt, it was built for the Sonneveld family. 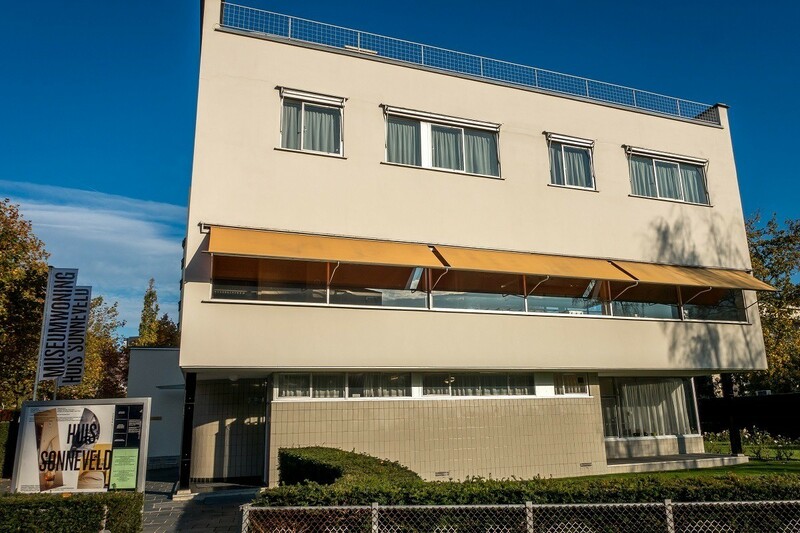 Since the house was completed in 1933, it is one of the older examples of Rotterdam architecture in the heart of the city. It survived the war unscathed but looks nothing like the typical homes you might expect from that period because the family embraced modernism in their everyday surroundings. 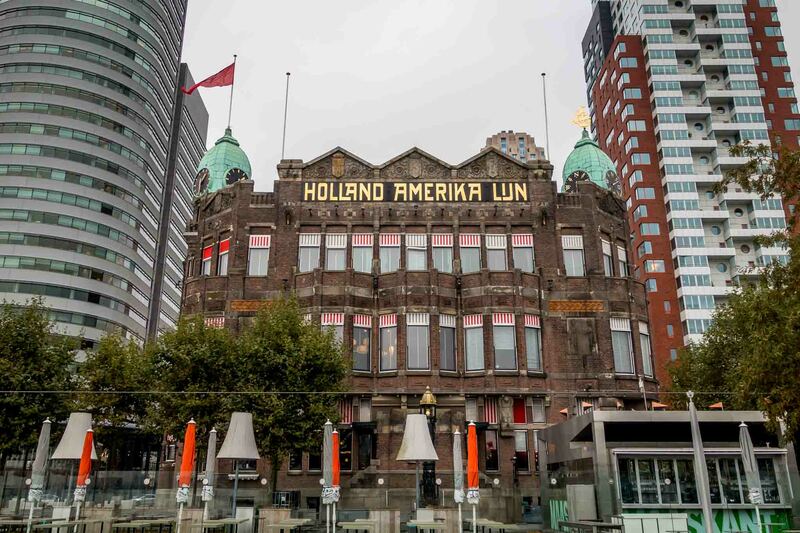 The historic building that now houses the Hotel New York was once the original headquarters of the Holland America cruise lines. For over 50 years, emigrants left this red-brick building bound for New York to start new lives in America. But after passenger service stopped in Rotterdam in 1971, the Holland America Line moved. Its headquarters remained vacant until it became the Hotel New York in 1993. The hotel has made an effort to preserve the building’s structure and character while constructing rooms and adding a seafood restaurant. The cast iron staircases, photos of emigrants, and original Art Nouveau decorations remind today’s hotel guests of the building’s past. 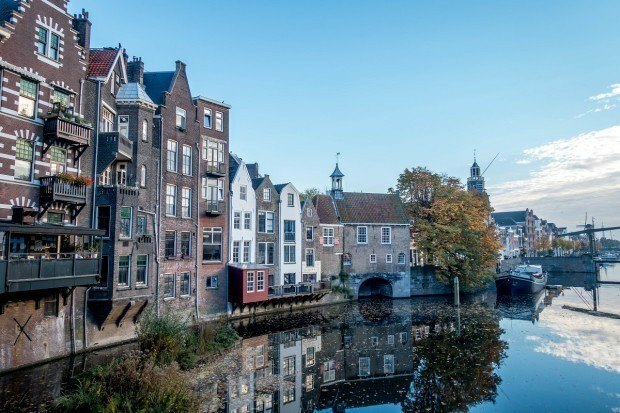 The small, inner-city harbor of Delfshaven is one of the few areas of Rotterdam where you can sense echoes of the city’s past. The yacht marina is one of the parts of the old city that survived the bombing of World War II. 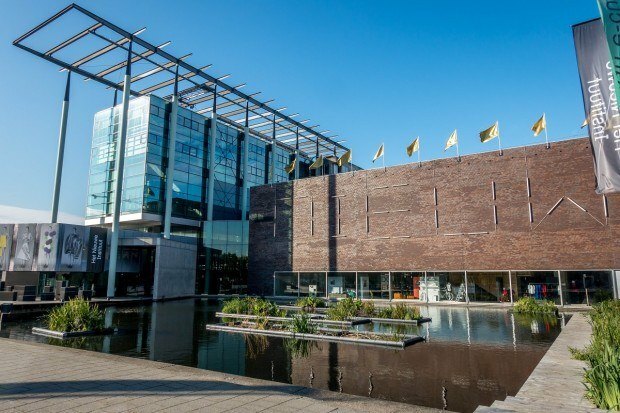 It has a noteworthy history both as the departure point for the Pilgrim Fathers heading to America and as the birthplace of one of the Dutch West India Company’s most famous commanders, Piet Hein. The restored mill “De Distileerketel” is also a must-see. Our visit was hosted by Rotterdam Partners, and we stayed at Bilderberg Parkhotel Rotterdam. All opinions of the unique and thought-provoking are our own. Have you been to Rotterdam? What did you think of the architecture there?